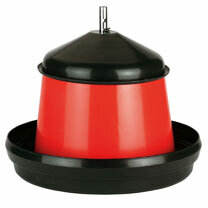 Break-proof plastic includes a lid, featuring adjustable feed level for free standing. Feed intake can be adapted using the height adjustment. Dimensions: 33 x 39 x 39cm.